Immediately following the event from the first book in the Powder Mage series, Promise of Blood, one of the surprisingly good series I've started this year, this was a very nice, albeit short return to the Powder Mage universe. If you enjoyed Promise of Blood you will most likely like this story, since it had the same vibe to it. I was really glad that I read it and it made me want to continue the series even more. I was already planning on reading the second book some time soon, but now I want to read it even sooner. Vlora is an interesting character and I hope we get to see more of her later in the series. 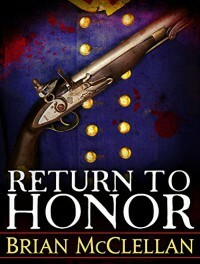 Return to Honor is a short story in the Powder Mage trilogy, consisting of Promise of Blood, The Crimson Campaign and The Autumn Republic.